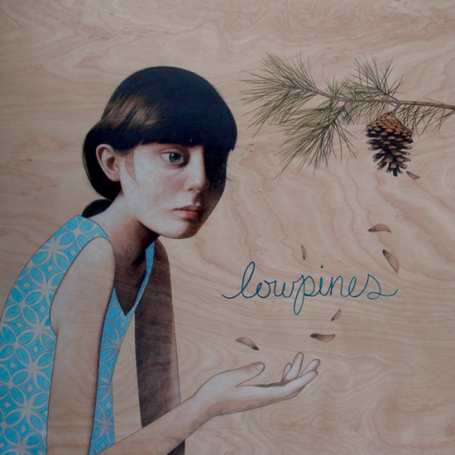 Lowpines are a cool co-ed duo hailing from west London. Behind the somber sounding band name are Oli Deakin and Lyla Foy, partners in the sublime. The talented two have released a minimalist masterpiece, Give Me a Horse, via EardrumsPop. Teasing us with only three songs, Lowpines open up the EP with the title track, a slow moving lo-fi acoustic waltz that meets somewhere between Bonnie Prince Billy and Smog. Deakin interjects some Bill Callahan/Jandek type of lyrics: “Give me a horse and I’ll give it grass to feed on the winter long / Give me a horse and I’ll keep it strong for you to ride on.” Much like Callahan, I’m sure the horse is metaphorical for the aching desire to be in a loving relationship. Foy’s convincing voice, along with a somber electric guitar enters to bring the song to a sweet climax. Quite frankly, “Give Me a Horse” is an excellent single. Opening with a softly cutting and climbing guitar lightly washed with effects, “Heavy Hander” is haunting in its efficient construction and pleasing in its economical use of vocals and instrumentation. Deakin and Foy magically meet in the chorus when they plead, “Come away heavy-hander / Give me back my summer sun.” It’s interesting how the duo can make the song simultaneously sound anxious and relaxing. The EP ends with “It’s Not Happening,” a cover of the Vancouver-based band The Be Good Tanyas. Though Deakin takes the lead on the vocals, this is the first time we hear Foy flex her vocal power without harmonizing with her band mate. Maybe I’m a bit too enamored with the Lowpines, but their version of the song is more heartfelt and emotional than the original. At the same time, I would’ve liked to have seen the band give the listener another original composition instead of a cover tune. I’m pleasantly surprised by Lowpines. I want more. I want more songs. I want a physical release of the EP to hold in my hands and wave around. I want to see them in concert. Heck, I even want a t-shirt and poster. The Lowpines have real talent. They aren’t just studio smoke and mirrors. Make sure you check out their fairly recent Daytrotter sessions where they give a beautiful performance of their few tracks. Oh, and I love the cover art. It fits the mood of the EP. Great job, guys. Write more songs! March 12, 2013. Tags: Bill Callahan, Bonnie Prince Billy, Daytrotter, EardrumsPop, Jandek, lo-fi, Lowpines, Lyla Foy, Oli Deakin, Smog, The Be Good Tanyas. Albums. 2 comments.